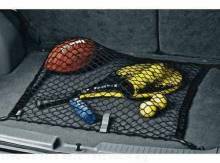 Cargo Net - Floor Mount * Keep packages and other loose items from spilling in your trunk. * The net stretches easily over bulky items and the soft braided cording wont damage painted surfaces. * Envelope and floor mount styles available. * Installs easily; no tools required.